36 minutes of vigorous exercise over 5 1/2 months, the results. To get more out of exercise it is essential to accurately determine the minimum effective dose and the amount of recovery time needed to produce improvement. Perry, age 69, does his weekly 30 minute strength training sessions at our Austin strength training facility. He recently began sprint training on one of our stationary bikes about three times a month. For the strength training we measure Perry’s time under load (TUL) for each exercise. When the TUL increases to a certain point we raise the weight the next session. Perry has been training for four years and continues to improve. We keep accurate records. · Same recovery level (heart rate) before beginning the next sprint. In May it took Perry 28 minutes to do six sprints. Five and half months later his time had gone down to 18:30 minutes. That is a 9 ½ minute improvement - the same work in far less time. Adding up all the twenty-two second sprints that comes out to a total of 36 minutes of sprinting time over 5 ½ months. With 330,000 workout sessions under our belts working with a wide range of ages and abilities, we have a good idea of what constitutes an effective dose of exercise (it is not that much) and the recovery time needed to produce ongoing improvement.The sprints are demanding - that is what stimulates change – but the time commitment is small, and the benefits are worth it. The cumulative improvements facilitate a longer life. HIIT workouts don’t take long, they are usually done once a week, and they are effective in addressing a wide range of health issues. Our workouts combine strength training and interval training; it’s a circuit of exercises working all the major muscle groups. We use MedX equipment. The equipment’s special medical rehab features make it adaptable for people of any age or condition. Those extremely out of shape need only do a little more than they are used to handling. Do a little more each week, and over time, the change will be transformative. Be stronger, live longer. At our Austin Personal Trainers facility we specialize in high intensity interval training (HIIT) for strength - one integrated workout combining strength training and interval training. The workout increases strength and endurance, and reverses mitochondria impairments to a level consistent with a younger stage in life. It is like having a fountain of youth. People of any age can benefit from this workout. We also have clients do interval training on stationary bikes. Past blog posts on mitochondria and a post on bike interval training. o Has lower rates of cardiovascular problems than aerobic exercise for those with heart conditions. As a result of doing HIIT your aches and pains will fade away, and you will be able to do the activities you enjoy – walk, run, ride your bike, gardening - better, longer and for many more years to come with less chance of injury. At Austin Personal Training and at New Orleans Fitness Trainers we offer HIIT. It is a 30 minute full-body workout done once or twice a week. This is a workout that you slowly build up to; anybody can do it. You’ll enhance your cardiorespiratory fitness and quality of life for decades to come. According to one study a force of up to three times body weight can be exerted on the human foot while running, and it can be much higher at times. Multiply that by each foot fall in a mile, and you have tons of weight absorbed through the joints and connective tissues. While some people are uniquely suited to do this high impact/high intensity jogging for decades of their adult life, many are not. For those who want to extend their running life there is a solution; keep running and substitute one running day with one session of high intensity interval training (HIIT) for strength. One less day a week of pounding and you'll have stronger muscles protecting those joints. Add up all those daysover the course of years of giving your joints a break. Your joints will thank you for it. At Austin Strength Trainers and at New Orleans Strength Trainers our HIIT full-body workout takes about 25 minutes, and it's non-stop. We use MedX equipment. The special medical-rehab features make it easier on the joints. Anybody of any age can do it; each week you do a little bit more that you are used to handling. Muscles are worked to a deep fatigue, and it is cardiovascularly demanding – just like running. It will add years to your running life and to your life in general. -HIT/BBS enacts a hormonal cascade that is the antithesis of the metabolic syndrome. -Gut motility correlates with muscle mass. Risk of GI cancer inversely correlates with gut motility. -Organ mass correlates with muscle mass. Get in an accident or severely burn yourself and the time you have in the ICU before you die is correlated with organ mass. You have more time on the clock. -Get in a car wreck and this kind of conditioning may be the difference between 3 days of whiplash symptoms and a lifetime in a wheelchair (which will be a shortened lifetime). -Cardiovascular benefits (see JEP article by Steele et al). -BDNF elevations with high intensity exercise staves off/reverses age related decline and dementia. -Enhances nitric oxide synthetase: you will have good blood pressure and will never need a little blue pill. You will not need to worry about “being healthy enough for sexual activity”. -Bone mineral density correlates with muscle mass. Even in osteopenia, strong muscles absorb forces and prevent fractures. -Basal metabolism and hormonal profile that fight obesity. From our website more benefits are listed here. At New Orleans Strength Trainers and at Austin Strength Trainers we have a long list of clients who have testified to life-altering positive change. There is an alternative to the positive changes produced by proper exercise. Do nothing; there will be a series of changes that will eventually result in a shorter compromised life. A study examined the effects of two different exercise protocols on health indicators such as insulin sensitivity and cardio-respiratory fitness. The two protocols: the sprint exercise protocol (SIT), three 20-second ‘all-out’ cycle sprints with two minutes of easy cycling between sprints and the moderate-intensity continuous training (MICT) protocol, 45 minutes of cycling at a moderate pace. Both had warm-up and cool down periods. The body adapts when exposed to more than it can handle; Sprints will do that. It is not how much exercise you can withstand it is how little is necessary to produce a positive result. This is an exercise regime that will change you, and it is one you can stick to; it's one of the exercise protocols we use at New Orleans Fitness Training and at Austin TX Fitness Training. Peak strength and endurance at the same time, Is it doable? An active Marine who trained a lot once told me, "Whenever I do my personal best at bench press my running is way off, and whenever I am at my best at running my bench press suffers". Alan Page was a 260 pound defensive tackle for the Minnesota Vikings. Toward end of his career he had trained for and completed a marathon – the first active NFL player to do so. He lost a significant amount of muscle; so much so that he switched position to linebacker at 225 pounds. When you run great distances carting around more muscle is demanding. You can improve strength and endurance at the same time. Strength and endurance complement each other up to a point. At some point one is going to suffer at the expense of the other. It is best to seek a balance. High Intensity Interval Training (HIIT) for strength will increase both endurance and strength. At Austin Personal Trainingand New Orleans Fitness trainers the trainers can put you through a series of exercises with little rest that will have your heart racing and have your muscles exhausted. Rest, recover, improve, and come back next week stronger with more endurance. Calcium channel blockers preserve the cell growth capacity against free-radical damage. Result: less free-radical damage, more mitochondria, and more muscular endurance with less time spent exercising. Additionally HIIT workouts burn more calories long after the workout is finished and the workouts will lower blood pressure and increase blood flow. It is not necessary to spend hours in the gym to get results. At Austin Personal Training and at New Orleans Fitness Trainers we can show you how to perform HIIT workouts on our aerobic equipment or our full body strength training circuits. More articles on HIIT here. With any exercise program if you set the bar too high you’ll likely quit. Set the bar lower and you are more likely stick to it and see more results in the long run. One way to do sprint training that I have seen recommended and I have tried: Warm up on an exercise bike or other aerobic equipment. Then go as fast as you can for 30 seconds. Recover at much slower RPMs for 90 seconds then repeat the cycle for a total of eight sprints. If you are truly going as fast as you can it will take a long time to acheive eight all-out sprints. It is grueling. It took me months to build up to eight sprints. I had great results, but I absolutely hated it. I had a sense of dread whenever I would go into the gym to do it. I eventually quit. Trying to go as fast as you can is a euphemism for trying to withstand as much pain as you can. These sprints are difficult. Approaching spring training in this manner was, for me, a prescription for quitting. After a three-month hiatus I finally had enough gumption to go back to this type of training, but I took a different approach. Instead of seeing how much I could withstand I set the bar lower. Instead of working up to a total of eight as-hard-as-you-can sprints I started at eight not-nearly-as-hard-as-you-can sprints. When I was done I said, “That's not so bad”. I kind of looked forward to the next session instead of dreading it. 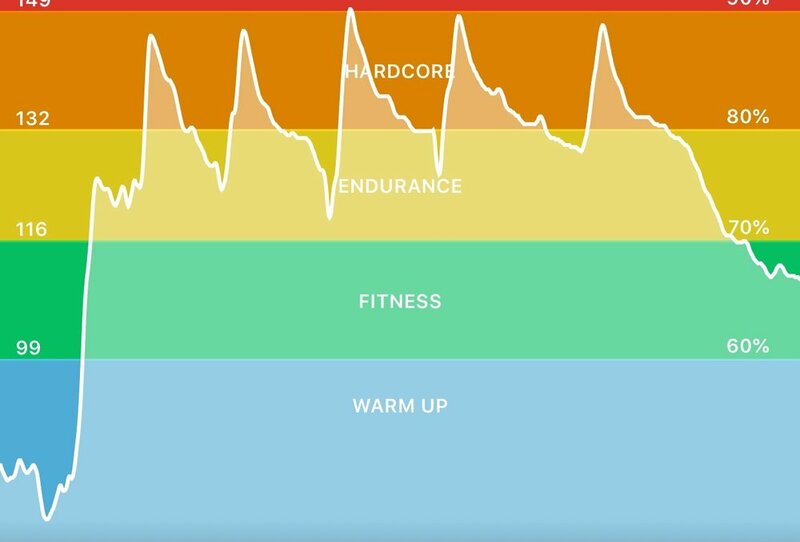 Instead of going to 95% of my maximum heart rate I went between 85% to 90% of my max, and instead of taking 90 seconds to recover, I waited for my pulse to come down before doing another sprint. At first doing a total of eight sprints took me 29 minutes, as the recovery periods were longer. With each session I patiently waited for my pulse to come back down and over a series of weeks my pulse came down quicker. After a couple of months I was still doing sprints. But instead of taking 29 minutes it only took me 21 minutes. I was very happy with this quantifiable improvement, and I did not dread the next sprint session. Sprint training is one form of high intensity training we do at Austin Personal Trainers. Dosage: A thirty second all-out sprint of on a bike, recover at a reduced RPM, repeat four to six times. Do this three times a week for two to six weeks. Results: 1. Increase both aerobic and anaerobic fitness. 2. Significantly lowers insulin resistance 3. Skeletal muscle adaptations that result in enhanced skeletal muscle fat oxidation 4. Improved glucose tolerance. I have been doing this for over a year now. I can report the following additional change. At age 60 I feel the best I have felt in well over a decade. At Austin Personal Training and at New Orleans Fitness Trainerswe can help you gradually build up to a high intensity strength training or an aerobic high intensity training program that is safe, effective, and efficient for your age and condition. You need not spend hours in the gym to feel better, look better, and perform better. Ted was a gifted runner. In his late forties his knees began to aggravate him, and they got worse each year. At age 54 his doctor advised him to stop running. He started strength training with the aim of getting back to running. We worked around his condition for a while and slowly incorporated leg exercises into the routine - leg curl, calf raises, leg press, adduction, abduction, squats, and occasionally partial leg extensions. Ted wanted to start running again. He did and the next day his was limping again. I told him, “You are able to lift 450 pounds on the leg press to a very deep fatigue to the point where your legs are unable to move, and the next day you have not a hint of pain.” For Ted with adequate rest after strength training he came back stronger each week. With running there was no recovery or improvement, only injury. We were following a high intensity interval training (HIIT) routine – one to three different exercises per body part with very little rest between sets. We were not doing endless sets exposing the knees to unnecessary stress. With this protocol there is less chance of repetitive-use injuries. Ted saw that it was working, but he was concerned about weight gain. I told him, “I could run a mile and be in pain for days, or I could eat three less Oreos and stick to a strength training program that will increase my resting metabolism. Besides, you will burn calories after the workout as well”. Ted had a choice. Run, get injured,and gain weight from inactivity, or strength train, get added protection against injury, and make some dietary changes. It is either the latter or face the possibility of knee replacement well before it might have have been otherwise. For those who overdo it or have a predisposition to injuries that result from running, injuries will occur. It might take years before they become ruinous. I don’t rule out running, but don’t run to the point of injury and take steps to enhance your strength so you can better support your joints. No amount of running will add strength to your legs, - endurance yes, but strength no. A ten year study comparing non-runners to runners showed that both groups had lost the same amount of lean body weight over the decade. Loss of muscle mass it part of the aging process. The best you can do is to take steps to keep or add the strength and muscle that inexorably diminishes each year without strength training. There cardiovascular effects from HIIT as well. Start with leg press or squats and work the muscles to a deep fatigue. You will reach your target heart rate very quickly. Just seconds after completion of the first exercise begin the next exercise. You will continue breathing hard, and your pulse will remain elevated. Work all the major muscle groups with minimal rest between each exercise. You will breath hard from start to finish. This type of training produces a high E.P.O.C. response – a large after-workout calorie burn. You build up to this workout slowly. At Austin Personal Trainers and New Orleans Fitness Training we can show you how. From this article in the International Journal of Obesity, High-intensity intermittent exercise attenuates ad-libitum energy intake comes this conclusion: “High-intensity intermittent exercise suppresses subsequent ad-libitum energy intake in overweight inactive men. This format of exercise was found to be well tolerated in an overweight population.” The study compared a group of over-weight men who did moderate exercise to another over-weight group who did high intensity interval exercise (HIIT). Seventy minutes after they exercised the HIT group consumed fewer calories and also consumed fewer calories the next day. That has been my experience as well – at least directly after a workout. On the days I had planned to do a sprint session it is not usual that I am trying to get the session in before I eat. I don’t want to do this type of high intensity training on a full stomach. So it often turns out that just when I was feeling hungry I do my sprint training. It often happens that I don’t feel like eating after exercise, but it is more pronounced after any form of HIIT either sprint training or HIIT strength training. For me that lack appetite lasts hours. At Austin Personal Training and at New Orleans Fitness Trainers we can help you gradually build up to a high intensity strength training or an aerobic high intensity training program that is safe, effective, and efficient for your age and condition. You need not spend hours in the gym to feel better, look better, and perform better. From this article, Short workouts: Will exercising for 15 minutes once a week get you fit? are some quotes and responses after the quotes. If something is too be good to be true then it follows that it really is too good to be true. The truth is the workouts are very demanding, but they won’t take a lot of your week. Anyone with proper instruction can do it though: you build up to it slowly. Our oldest client was 95 years old. The truth is these workouts have been around for decades. Forty years ago body builder Mike Mentzer did as little as four exercises a week. “The key to the short workout’s success revolves around a concept known as high-intensity interval training (HIIT). HIIT is a heightened form of interval training that involves alternating between periods of short, intense physical activity and fixed periods of low activity or rest." With longer volume-type workouts the goal is to do more – more reps or more sets. The only way to do that is to try to conserve your efforts. There is a bias away from intensity. With HIIT the goal is to make the reps so intense that you cannot do additional reps. Exercising with a bias toward intensity results in a much more productive session. This is called Excessive Post-exercise Oxygen Consumption (EPOC), and there is no other form of exercise that produces more EPOC than HIIT for strength. The article goes on to talk about frequency of exercise. You will be able to do sprint training more often than strength training. If you are doing sprint interval training there is less restructuring of tissue taking place after the exercise, while HIIT strength training involves extensive restructuring of damaged tissue after a bout of exercise. It will take longer to totally recover. It will vary by individual as to the necessary recover time. Our experience after conducting literally tens of thousands of exercise sessions over the years is that less is more. We start from the premise of seeing how little exercise is needed to produce significant results rather than from the premise of seeing how much exercise one can withstand. The former is a prescription for progress, and the later is a prescription for over-training. From the study: Brief, intense exercise training may induce metabolic and performance adaptations comparable to traditional endurance training....Given the large difference in training volume, these data demonstrate that SIT is a time-efficient strategy to induce rapid adaptations in skeletal muscle and exercise performance that are comparable to ET in young active men. Brief, intense exercise training can be accomplished on aerobic equipment or by doing a series of strength training exercises. We can show you how to both at New Orleans Fitness Trainers and at Austin Personal Training Both are safe, effective, and efficient. You don't need to spend hours in the gym. One can live well without requiring hours each week engaged in monotonous exercise. Significant strength increases occur exercising as little as once or twice a week IF it's the right exercise program with the right trainer. Such a workout can be very demanding, but people or any age or fitness level can do this and benefit from it. Clients slowly build up to a level they can handle. It is an attractive alternative for those who often don't have time for exercise. “Workouts typically consist of one set of six to 12 exercises with little rest between sets…. trainers find a weight load that renders muscle fatigue in 60 to 90 seconds, and take clients through a full-body workout in approximately 30 minutes”. Bob Wright is a very busy man. He serves as vice chairman and executive officer of General Electric Co. He injured his shoulder playing golf. To avoid surgery he began lifting weights to stabilize his shoulder. He got great results. Others with shoulder injuries have too. The fitness trainers at Austin Personal Training and the fitness trainers atNew Orleans Personal Training can guide you through a similar personal training program that will enable you to get more out of less time exercising. A May 3, 2007 New York Times article, A Healthy Mix of Rest and Motion, suggests that for at least one workout a week it pays to alternate short bursts of high-intensity exercise with easy-does-it recovery. This type of high intensity interval training comes in many forms. Examples are running (or sprinting) the straight-aways and walking the curves for several laps or cycling hard (or very hard) for a minute and then coasting for a minute then repeating the sequence. It can also be done with strength training – a series of demanding strength training exercises with a little respite between the exercises. “A 2005 study published in the Journal of Applied Physiology found that after just two weeks of interval training, six of the eight college-age men and women doubled their endurance, or the amount of time they could ride a bicycle at moderate intensity before exhaustion'. And this: "New evidence suggests that a workout with steep peaks and valleys can dramatically improve cardiovascular fitness and raise the body’s potential to burn fat". Researchers at McMaster University in Hamilton, Ontario, had the exercisers sprint for 30 seconds, then either stop or pedal gently for four minutes. Eight volunteers in a control group, who did not do any interval training, showed no improvement in endurance. Such a dramatic improvement in endurance after 15 minutes of intense cycling spread over two weeks was all the more surprising because the volunteers were already reasonably fit. They jogged, biked or did aerobic exercise two to three times a week. The study focused on the improved performance resulting from interval training, but there are other benefits. Interval training offers protection against Type 2 diabetes, can help with weight loss and can lower the riskof heart disease. It is postulated in the article that many people who are not active enough to keep muscles healthy and who are at the sedentary extreme might develop “metabolic stalling” — carbohydrates in the form of blood glucose and fat particles in the form of triglycerides sit in the blood. This could be a contributing factor to metabolic syndrome, the combination of obesity, insulin resistance, high cholesterol and elevated triglycerides that increases the risk of heart disease and diabetes. The article concludes by saying: “By recruiting new muscle fibers and increasing the body’s ability to use fuel, interval training could potentially lower the risk of metabolic syndrome”. You will burn calories long after the workout is over at a rate higher that other forms of exercise. The study, from scientists at Canada's McMaster University, adds to the growing evidence for the benefits of short term high-intensity interval training (HIT) as a time-efficient but safe alternative to traditional types of moderate long term exercise. Astonishingly, it is possible to get more by doing less! The study also provides insight into the molecular signals that regulate muscle adaptation to interval training. It appears that HIT stimulates many of the same cellular pathways that are responsible for the beneficial effects we associate with endurance training. The training method in the study consisted of doing a series of 10 one-minute sprints on a standard stationary bike with about one minute of rest in between, three times a week. High intensity interval training (HIIT) can also done by doing a series of strength training exercises with brief rest periods between each exercise. The advantage of this type of training over the stationary bike is that one can get a whole body workout addressing all the major muscle groups of the body and also have the desired cardiovascular effect. HIIT is the type of strength training we do at Austin Personal Trainersand New Orleans Personal Training.